Thank you for choosing to manage your prescription(s) at Refill.WedgewoodPharmacy.com. Medications compounded by Wedgewood Pharmacy are prepared at the direction of a prescriber. Many compounded preparations are commonly prescribed, and supported by literature, to treat particular disease-state. Wedgewood Pharmacy does not make claims for the efficacy of our compounded preparations. Once you’re enrolled in the Auto Refill program, there is no need to do a thing, that’s the great thing about Auto Refill – it’s automatic so you don’t have to worry. We will automatically send your refill right on time, every time you're due and we will automatically bill the credit card we have on file. You’ll get an email notification 3 days before we bill your credit card and ship your medication. You’ll also get notifications when your prescription is low on refills or ready to expire. Signing up is easy! 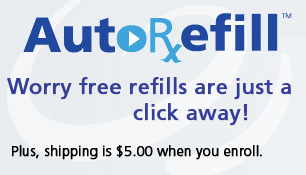 Simply sign in using your prescription number and check the check box under "Enroll in Auto Refill program".